Return to Cain page. Return to Stith Valley home page. Mrs. Christine M. Cain, 77, wife of J. Andrew Cain, died October 10 at Good Samaritan Hospital seven weeks after suffering a fractured hip. She was a native of Frankfort and came to Versailles with Mr. Cain early in their married life. 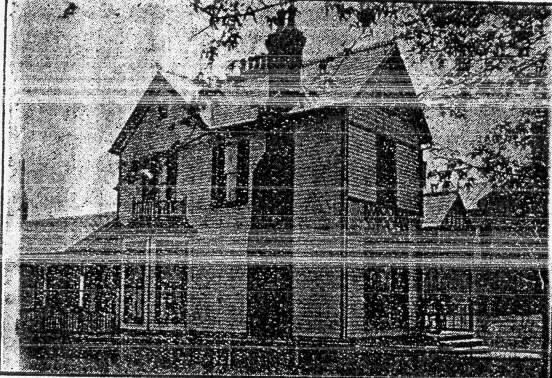 They made their home here until about 1922, when they moved to Lawrenceburg. Mr. Cain was long the proprietor of Hope Mills on Green Street in Versailles. Two of Mrs. Cain's three sons survived her, along with her husband and nine grandchildren. Burial was in the Frankfort Cemetery. The handsome place shown in the engraving is the home of Mr. J. Andrew Cain. It is embowered in trees and is as comfortable and home-like a spot as one would wish to find. Mr. Cain is the senior partner of the firm of Cain & Rout, who operate large flouring mills here, and is said to be one of the best millers in the country. Mr. Cain is a broad-minded, shrewd, but generous and liberal man, who is wide-awake, always full of public spirit, and a valuable citizen in any community. He came to Versailles from Frankfort a number or years ago.